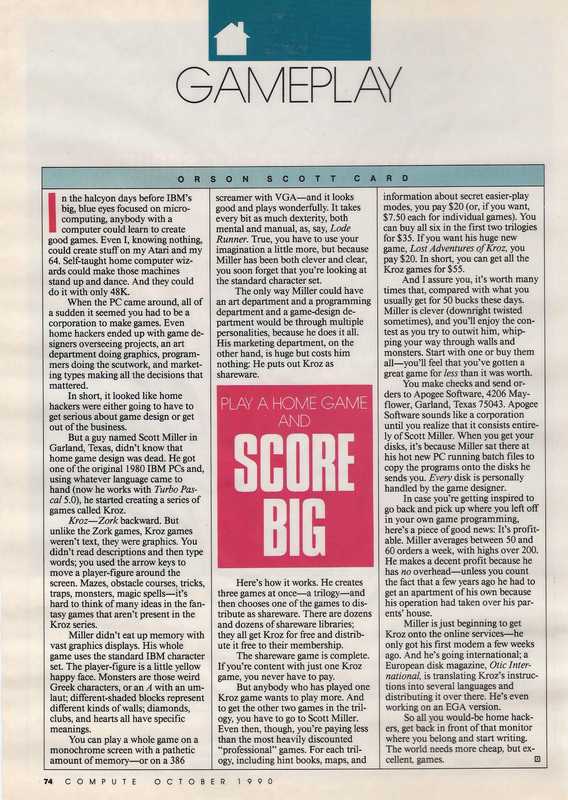 Twenty-five years ago, famed science fiction writer, Orson Scott Card, most famous for his brilliant Ender's Game series, contacted me because he had become hooked on one of my early games, Kroz. At the time, I had read Ender's Game and considered it one of my all-time favorite fictional stories. So it was quite a thrill to be interviewed by this author. An interesting note to this interview is that Card mentioned that his son, Geoffrey, was a fan of my game and had taken to playing it a lot. So, about 18 years later I learned that Geoffrey had become a game development professional, and over the years he and I have become online friends in several forums, including Facebook. So I couldn't resist asking him very recently if he had any memories of Kroz. Here's what he wrote: "I saw that [my father] was playing this weird game with ASCII characters, and I asked him to explain what was going on. He pointed out the walls and monsters and other interactive elements ... but the thing that made me want to play was when he fell down a bottomless pit and died. The quick perspective change and the humor made me want to play the game myself, and I got really into it for a while. It might have been that enthusiasm that led my dad to think this tiny, one-man game was worth an entire column." Last edited by Joe Siegler; 03-31-2015 at 12:55 PM. Excellent article! Keep them coming! 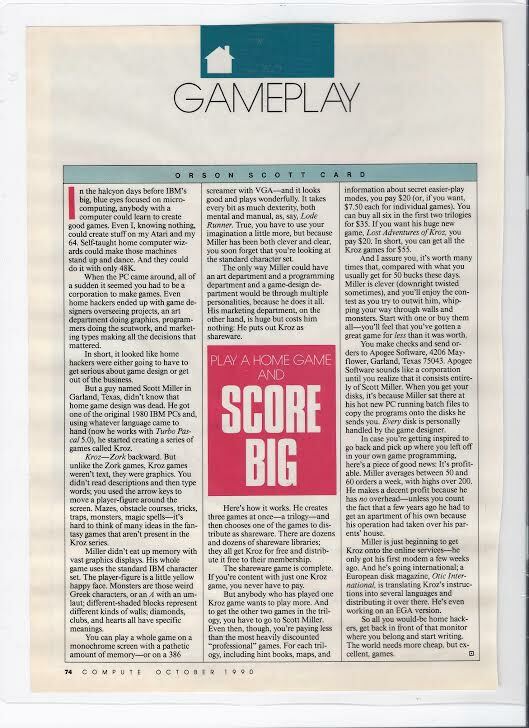 Scott Miller was working on an EGA version of Kroz? Was that the same project as The Underground Empire of Kroz?